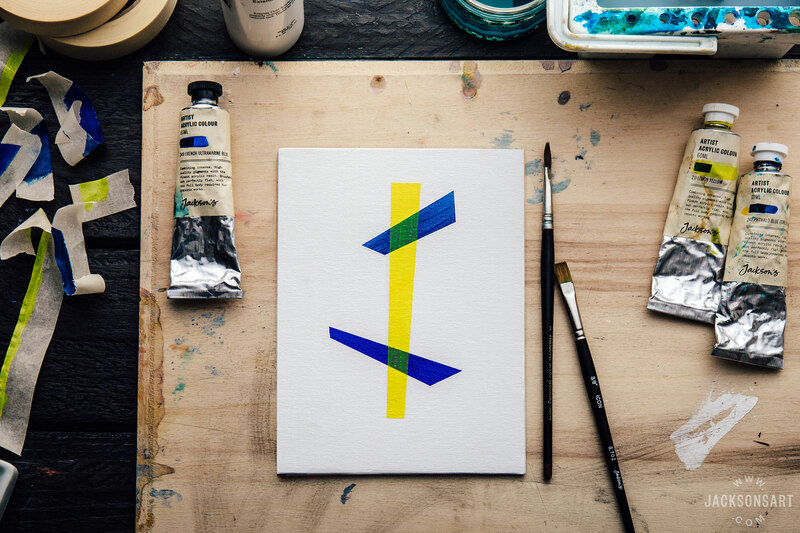 Many artists use masking tape to create hard edges in acrylic painting. Hard-edged geometric abstraction often relies on the precision that a masked edge can give you, and other artists find a strong straight edge in just part of their painting can set off the other, more painterly areas of the work. 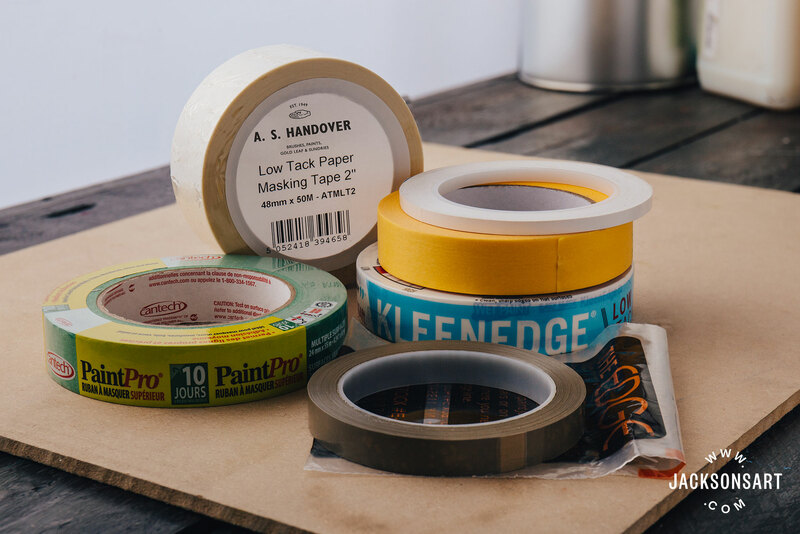 If you’ve tried using masking tape, had paint seep under it and given up because it didn’t seem to work – here is a technique that might solve the problems you were having and make the method work for you. 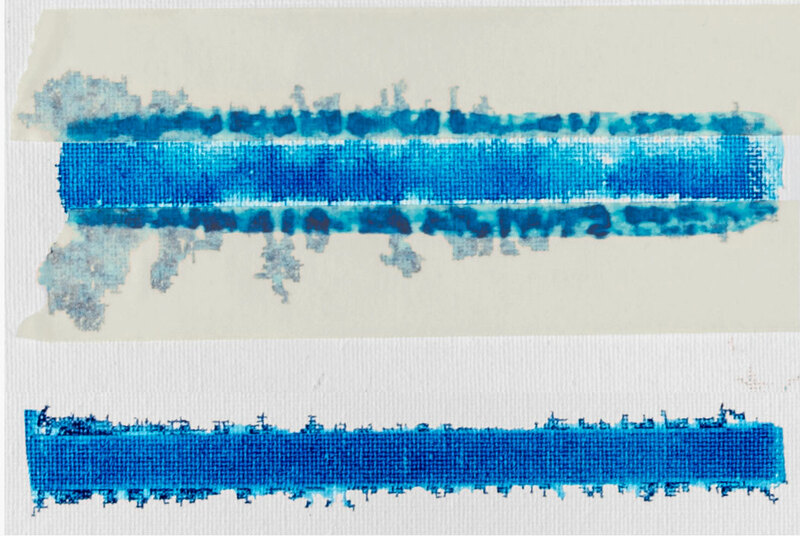 Two examples of acrylic paint seeping quite badly under masking tape. The top image still has the tape on. 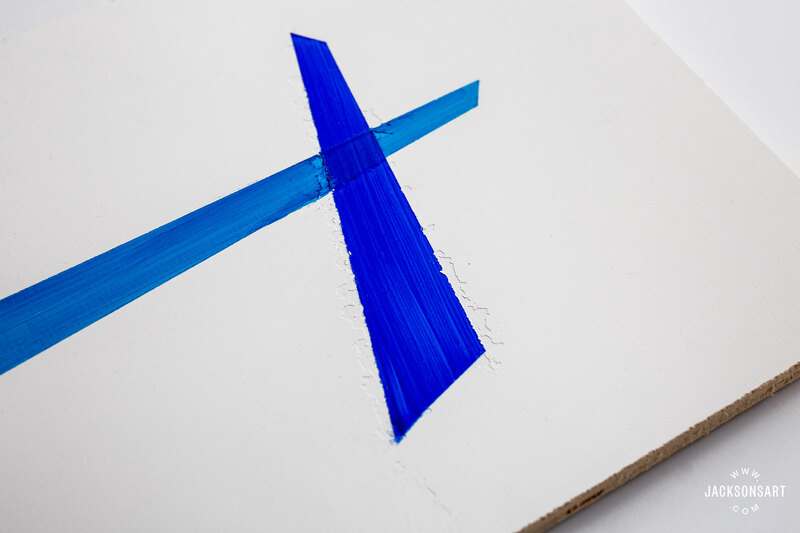 Even on a very smooth surface fluid paint often seeps under the edge of masking tape but on a textured surface like canvas it is even harder to get the tape to attach completely along the edge. You can’t always see the leaks until you remove the tape and then you might spend quite some time wiping away wet paint or painting over dried leaks of paint. The key is to get the tape to create a smooth solid barrier along the edge. 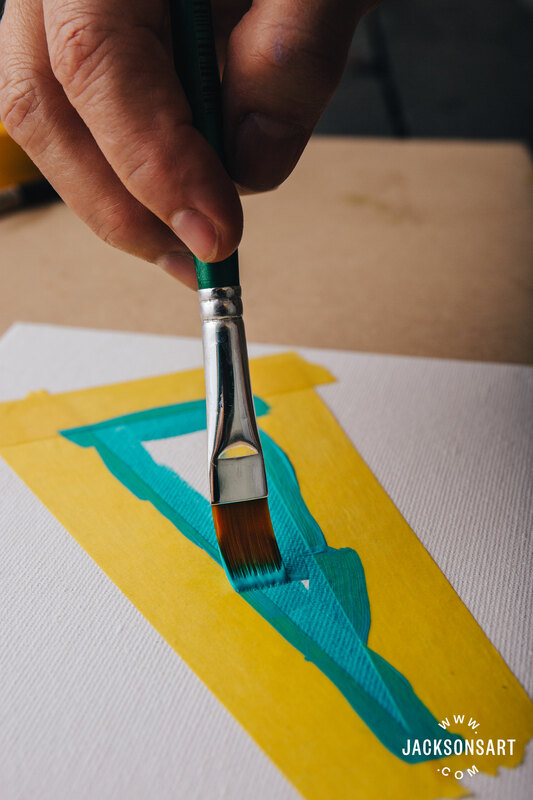 One good way to keep the paint from seeping under the tape is to paint a thin layer of clear acrylic over the edge of the tape, wait until it is dry, then paint on your acrylic colour and pull away the masking tape. This removes the colour over the top of the tape as well as tears away the very thin layer of clear acrylic along the tape line. So you have a perfect edge. 1. 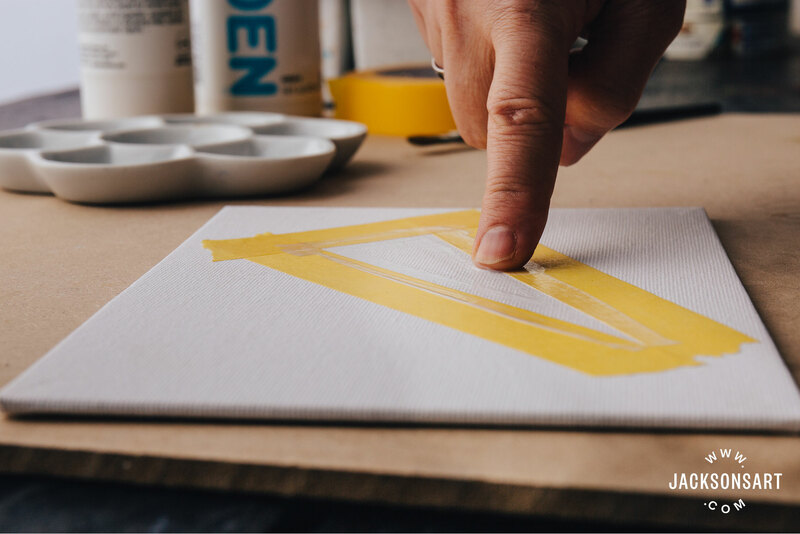 Brush 2 coats of a clear fluid acrylic medium such as GAC 500 onto the edge of your masking tape, along the edge that will be the hard edge of your painted design. Let dry to the touch between coats. 2. The tape will get wet and some react by wrinkling, so the next step is essential – finger burnishing. Burnish down the wet tape with your finger. Do this for both applications of the GAC 500 – run your finger along the edge of the wet tape to press down all the wavy edges that appear when the tape reacts to the water in the medium, until it lies flat. When you are happy that your tape is lying flat to your canvas and the edge has a thin seal, let it dry. 3. Paint your colour in your taped shape area and remove the tape as soon as you are done, before the paint is dry. If the paint dries it forms a bond with the edge of the tape and I find when removing the tape the tape tears and leaves a thin piece of tape stuck to the paint that is difficult to remove. Brush 2 coats of GAC 500 along the edge, smooth over any brush marks. Let dry between coats. Burnish down the edge of the wet tape with your finger. Some tapes will wrinkle up more than others when they get wet. Our yellow tape is a good choice for this because it reacts very little to water and is very low-tack. Remove the tape right away. We have a good selection of low-tack and medium-tack tapes. 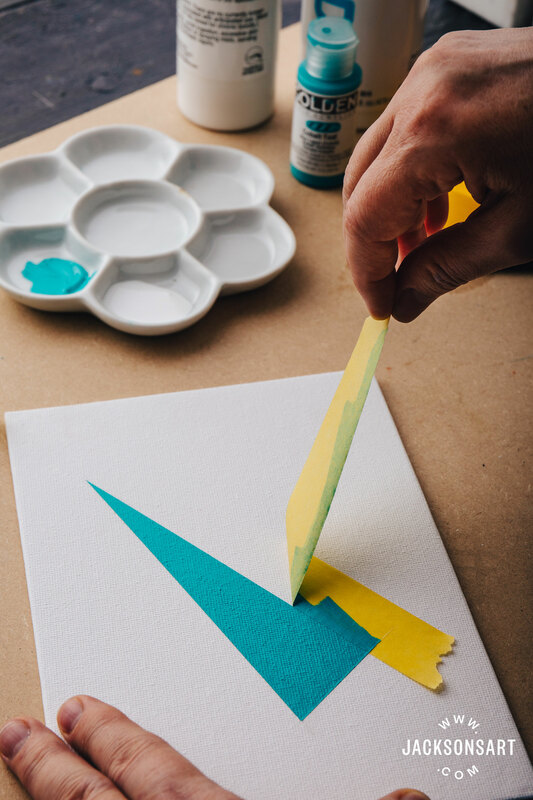 If you are layering hard edge shapes, so you need to tape on top of paint as you build up layers, it will be necessary to use low-tack tape to be sure to not disturb your previous paint layers. Regular masking tape can remove your earlier acrylic paint and I have had it even pull off chunks of the gesso on a gesso panel (see image below). 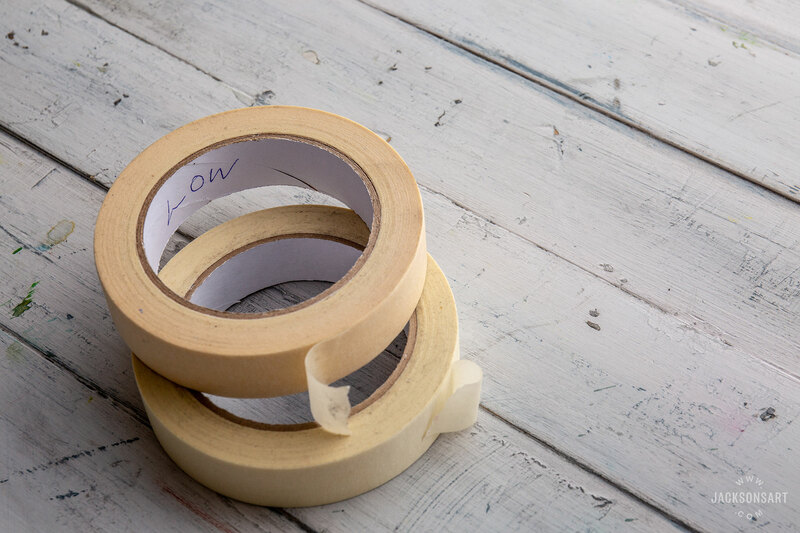 If low-tack tape is not available you can remove some of the stick from your tape by sticking it to a clean table top, peeling it up and doing that a few times, picking up a bit of dust. I tried doing it on my jeans but the dark fluff that stuck to the tape ended up visible under the paint as a few bits stuck out sideways from the tape. So something clean is better, or at least not with fibres. 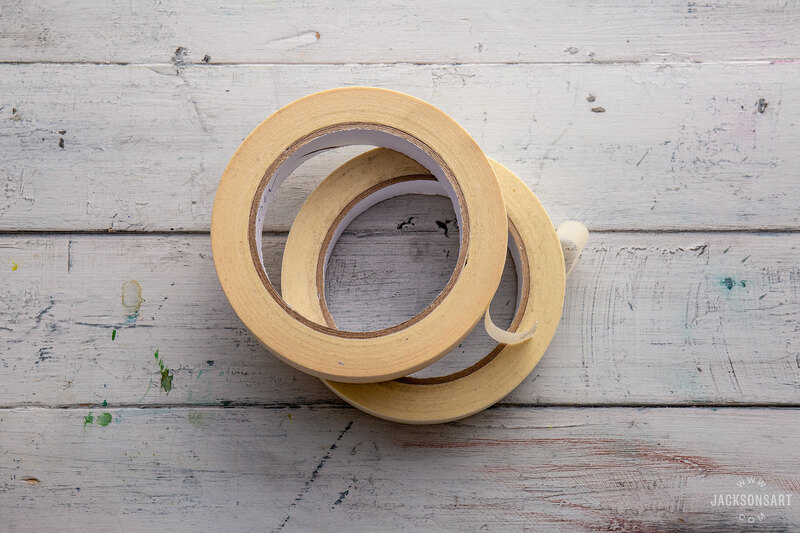 Even low-tack tape can damage a previous layer of paint so might need a bit of this treatment. It doesn’t need to be super-sticky anyway since you are sealing the edge. Some tapes will wrinkle up more than others when they get wet. Our yellow tape is a good choice for this because it reacts very little to water and is very low-tack. This shows the areas of gesso that tore away with regular masking tape. After removing the cellophane wrapper some tapes look the same, if they don’t have any printing in the centre core. I find it is helpful to write the type of tape on the cardboard core to keep track of the different tapes. 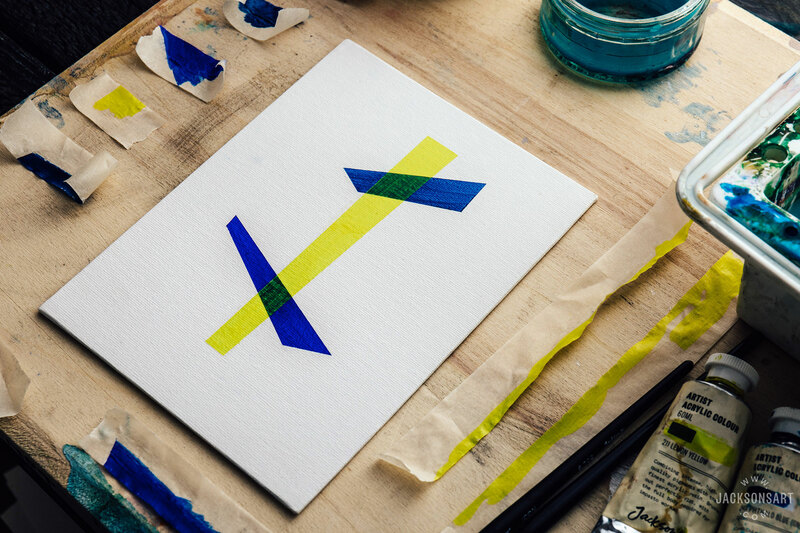 You may find this works differently if you are using a different surface or tape. As always I recommend experimenting to find what works best for what you are trying to accomplish and the materials you are using. 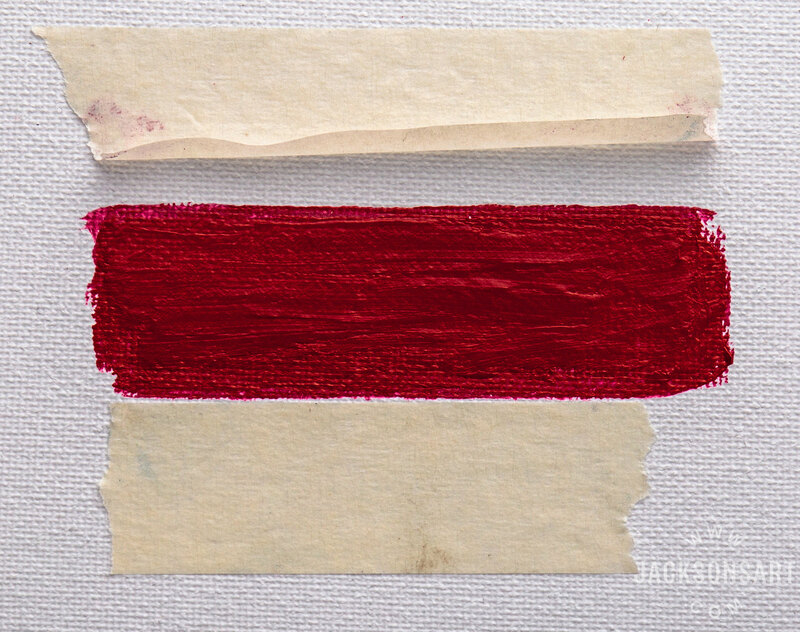 The sealing method could work for oil painting if doing a single layer so you are sealing the tape on canvas, not on an earlier layer of oil paint. Because you wouldn’t want to paint the acrylic medium on top of oil paint, but you can paint the oil paint on top of dried acrylic medium. Perhaps you could experiment with a fast drying oil medium to seal the edge, but it would need to dry clear. If you are not looking for a hard edge but a more-or-less straight edge then masking tape can still be useful. Instead of sealing it and using it as a stencil you can hand paint your acrylic or oil up to the edge and not over. By using it as a guide in this way you get a pretty straight line but it still looks hand-painted. A bit like painting up to a pencil line but without needing to erase anything. 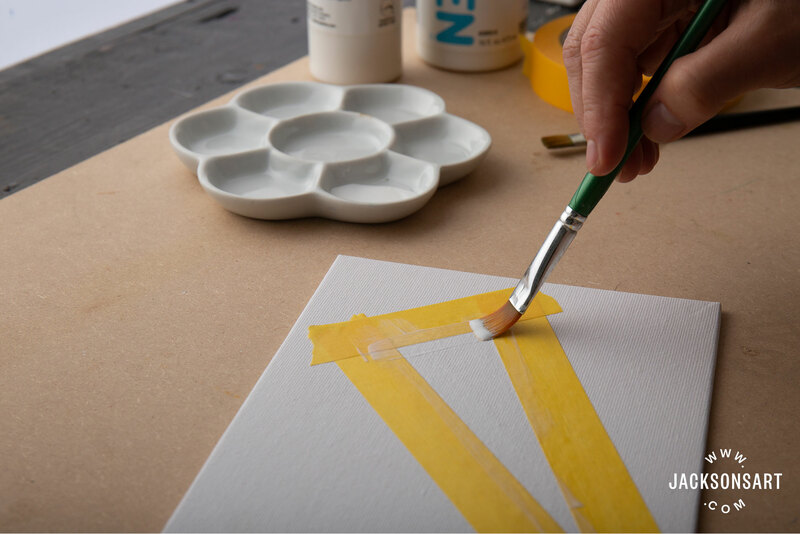 You can use masking tape as a guide to paint your acrylic or oil up to the edge but not over. By using it this way you get a pretty straight line but it still looks hand-painted, and you don’t have any lines to erase.